To say that providing a geographically scattered community with broadband is difficult, we are finding is one of the understatements of the year. My optimism of a couple of years ago has long since vanished as the problems emerge as to how tricky everything is becoming. The latest little piece of knowledge we came across is that there is going to be a world shortage of IP addresses. These are only available in batches of 256, why that number I have no idea, and cost a fair bit to rent and even more to buy. As our new system has meant that we are now all on individual IP addresses and we are close to using that number then those on the waiting list have a further problem to overcome. I suppose that our problems are taking place in a background of poor broadband over our whole area. In fact the NW Highlands and Islands have among the poorest service of the whole country. We also hear that BT have “negotiated” a deal that is to give them the monopoly to roll out next generation to 99% of the country. The rather big caveat is that they are do not need to service around 650000 people, the 1%, and I wonder where they will be living. Locally rumours are rife about BT actually providing fibre optic in Applecross with workmen looking for six months accommodation for bringing it in over the Bealach. Our contacts say that this is not going to happen but already there are two cabinets built at the exchange and Milton. Of corse this means that those outlying areas will be in the same boat as before with BT taking the core of the customers away from AppleNet. This appears to be coming over from Skye and, assuming the copper lines in Applecross are in good nick, will be distributed from these cabinets. Going by what one hears from Skye the source of this new system leaves a lot to be desired and also BT numbers on lines are far more than AppleNets. There is a strong rumour that the fibre cable coming over the Hill is going direct to Sand and will not be available to the community at all. The workmen say otherwise so basically everyone is in the dark. South to HUBS and there are all sorts of machinations going on as we are being connected up to the new system. Currently we have been offline for around six of the last eight weeks and in today’s world, as we are both involved in various issues that need a fair bit of communication, that is seriously hampering our volunteering and work. Also to be noted that a company providing satellite service to one of our customers has gone bankrupt, proving all is not well in rural broadband circles. It is also a problem describing our efforts not as a business to some customers but a social enterprise providing a service. Sure the bottom line has to be kept in the black but were are not in business to make money and if we do it is purely for reinvestment. after a tour of a very smartly done up accommodation post fire. Prices range from £250 to £25 so all tastes accounted for. Views from the cafe and rooms at the front almost match Applecross. A good catchup as usual, Lyn being my PE teacher at school back in the day. Lovely day and would have been better spent out on the water catching langoustines but needs must sometimes and the trip and company meant a good day out. variety keeps one fresh after all. Who knows where broadband is heading in the near future. We are “expected” to now apply for next generation speeds. Bit ironic as we are barely up to first generation speeds. The forms and work, coupled with the technical expertise and lack of time all works against us having much of a chance of going onto the next stage. As the switch over continues Sean, who is a pretty fast learner, is finding so many anomalies in our set up which may go some way to explaining why some connections have stubbornly remained slow. As well as this we are having to deal with problems in the new system, ranging from radio reception to tidal. To be perfectly honest our broadband at the schoolhouse has gone back in quality since we have been trying to improve the setup, but patience is always going to be a virtue living in rural parts while still trying to improve services. I no longer predict times for improvements as the last prediction was we were going to have vastly improved speeds on 9th November 2015. Beautifully shot and many more of the lovely bride are online. 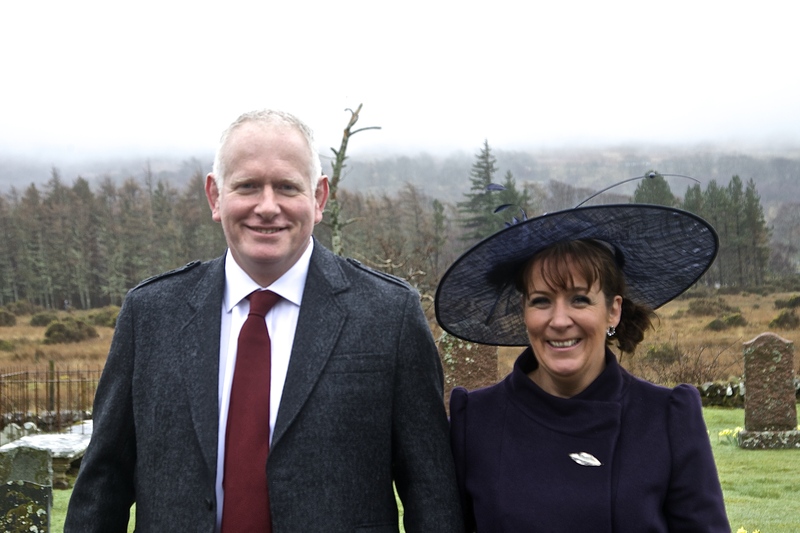 Best Man, Best Groom and Best Bride. after piping us into a lovely meal. making sure the night was well documented. and headed off to a very sensible early and soberish night. Think Calum was still up throwing the water bottle to No1. Another fine breakfast saw us off on time to make it home for the evening shift at the Inn. Uneventful trip back with Raymond in attendance. Only needed to do a couple of hours as there were plenty of staff on the go. Sat the fourteen who just turned up in amongst the rest of the punters, would have been good if they had all paid, Boss had an attempt to see if any one would see them on the road, but police over in Skye so a shrug of the shoulders. Good eleven and a half hours sleep before going out for the rest of the langoustines hanging off the Varuna and then heading up to a busy shift, but manageable and little to distinguish it apart from the very pleasant and pleased Galicians and New Yorkers. Seafood helped them on their way. Tomorrow it is off to Raasay on broadband duty. Broadband is becoming a massive headache for us but more of that next time. setting stunning and very Scottish, mist, glen and pipes. 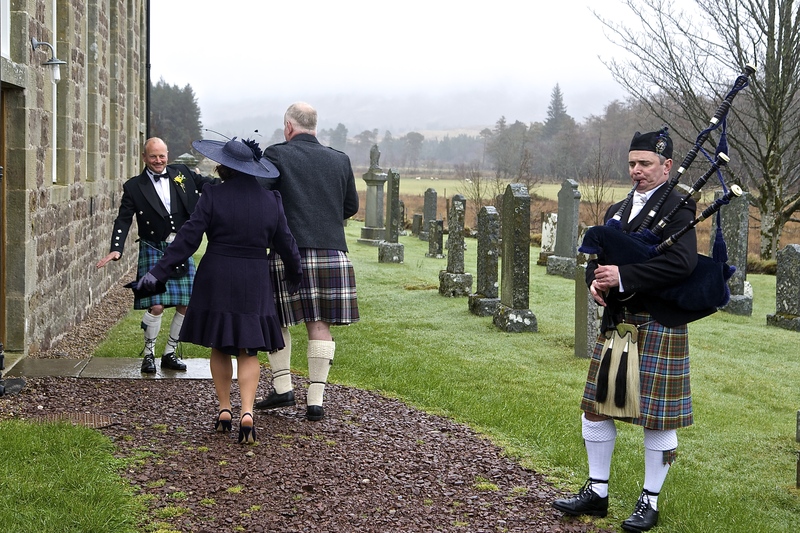 Lovely simple humanist ceremony at Clachan, followed by canopies and hog roast at the VT. One or two photos taken, I know I could never be an official snapper and only took the one posed. Quite pleased with it though. Nipped down the road, called in to the Inn, busy but not silly, and took the dogs out. Back up to the ceilidh and a fine one it was, to the tunes of Iron Midden. Despite not drinking I find these events go just fine and can enjoy the craic and gossip with anyone. the time just flew by. Of course there was the odd dance or five to get through, Orcadian strip the willows, dashing white sergeants, eight some reels and the odd boston two-step. Made it to the end of them all but could have done with an oxygen tank to recover with in the corner. Managed to head off as it thinned out towards the end of the evening. Home just after the witching hour and the advantages of not drinking come into play at the end of the evening. and Andy and Jill had a fine walk out to Ardban to finish off their weekend. Monday morning saw me up bright and breezy to sell prawns to a Russian, a lady married to an east coaster who come this way every year. Not many and really just a wee favour as I could not do it yesterday, they normally grill them in Applecross but took these ones away with them in the morning. The rest of the day did not really happen with a breeze from the south making it a bit uncomfortable to fish, just use up my reserves. Tuesday’s wee excuse was a meeting up with Landward to say how wonderful the fishing is in inshore waters, just feeling a little sarcastic when I think back into the past and what we had fishwise from shoals of pelagic, salmon and white fish and now it is bottom feeders. Gets me out of the house anyway.